Awww, yeah, it’s a new villain! Play some appropriately villainous theme music! Uh, actually, let’s not do that. Boring Fact: Saffron’s last name, Saldarriaga, comes from a co-worker of mine whose last name sounded cool. Cinnamon’s last name is Canela. But why is she here? Where did she come from? We’ll have to wait and find out together. 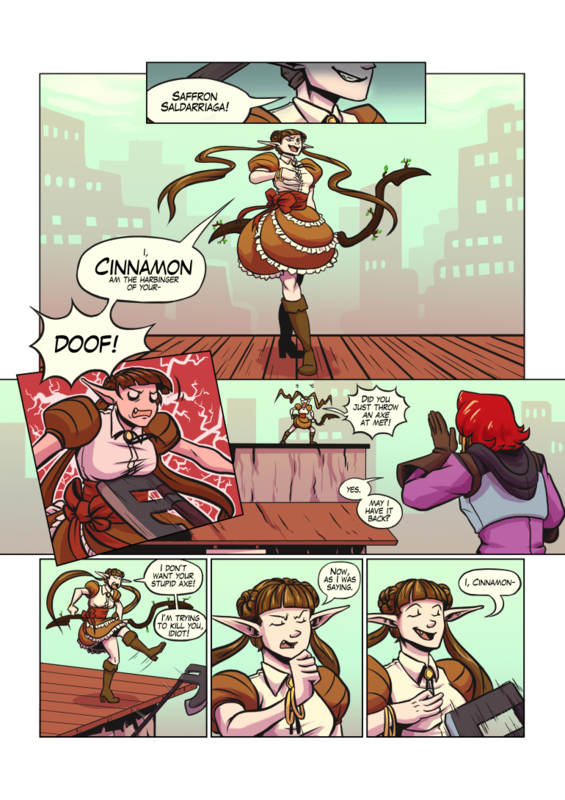 How many times do you think Saffron can throw that axe before Cinnamon refuses to throw it back? How do you pronounce Saldarriaga? Also I love the alliterative names and can’t wait to see Cinnamon and Saffron fight. I am 100% behind Saffron’s attacking methods. Okay it’s pretty obvious Saffron done stole her man! Prince Faunus: Most eligible bachelor in…..well I don’t know Faunusberg? Also, quirky female villains are the best. She has a chance of about 20% to hit Cinnamon with the bladed side of the axe. I see Cinnamon studied at the Team Rocket School of Villainy. Must have been an exchange program. Shoot. I anticipated Saldarriaga to be Saffron’s scientific name. Dang, it’s actually crocus sativus.